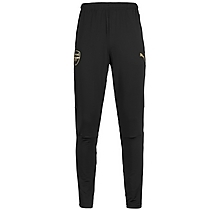 The 2017/18 Arsenal Coach Training Fleece worn by the coaching team. Offering both comfort and warmth this training fleece features the Puma warmCELL material technology. This material is designed to retain heat close to the body to maintain optimum temperature in colder climates. With a funnel neck, 1/4 zip opening and stretch cuffs and waist, warmth and comfort are key factors to this design.